Sutrobath - "Spirit Of The Audio"
From the Northwestern state of Washington, Sutrobath are led by musician/songwriters Mike Soiseth and Rob Wollam. The music on their debut CD, Spirit Of The Audio, has an 80's Brit-pop sound though the influence of the Beatles, Squeeze and similar bands is apparent on many of the tracks. While this may be MTV friendly stuff, the songs are well constructed, there's variety across the tracks, and the band incorporate lots of well thought out sounds and effects to keep things interesting most of the time. Songs like "Divided" with their orchestrated yet Beatlesque sound are among the stronger tunes, though I was partial to the ballsier rocking "Rome", and of course noticed the bubbly psych guitar on "Überman". Overall I think the average Aural Innovations reader may find this a bit too mainstream but if the Beatles and Squeeze analogies arouse your curiosity than be assured there's much here for you to enjoy. 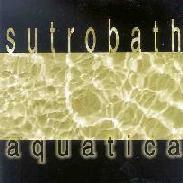 Aquatica is Sutrobath's latest release and... Wow! Talk about moving to the next level from one release to the next.. 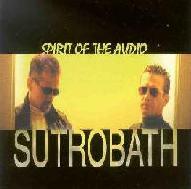 The basic sound heard on Spirit Of The Audio is intact, but Sutrobath wrap it in a heavy power rock sound, the excellent production giving a heavy rockin punch to their brand of pop music. The song constructions are even more sophisticated than those on Spirit Of The Audio, and the lads do so without sacrificing one iota of accessibility. Hell, that's what made the Beatles so great! Songs like "You're In Love" with it's Squeeze sound, and "Never Been Better" that recalls the Beatles, are the most similar to the earlier album. But then there's "Holiday" with its power pop take on the Beatles. And the thundering metallic assault of "Wave Break". And I dig that Didgeridoo opening on "Fabulous Nothing". Lots going on here folks. Among my favorite songs is the title track, which begins like an old Pink Floyd song with cool bubbling space guitar efx embellishing the music. When it launches into the main portion of the song it shifts into more pop oriented territory, yet still has a gorgeous full sound and a prog rock feel as well. "Superday" is a metallic power pop tune embellished by even more freaky efx. "Solo Tonight" features a lovely combination of psychedelia, acoustic Led Zeppelin, and hard power rock. I was simultaneously floating and head banging to this killer track. And "White Star" includes still more power rock with hints of psychedelia. I'll summarize Aquatica the same as I did Spirit Of The Audio, except to add that if this was released in the 1980's these guys would have been among the era's heavyweights (for those of you who agree that there actually was some damn good pop music in that decade). For more information you can visit the Sutrobath web site at: http://www.sutrobath.com/. Hear songs at the Sutrobath Mp3.com web site at: http://www.mp3.com/sutrobath.